Quick! What company is promoting its breakfast fare? If you thought the Golden Arches, it's understandable. After all, McDonalds is associated probably more than any other brand with breakfast eaten out of the home or on-the-go. It's not come free: they've spent millions of dollars to establish themselves in pole position in this regard, in the minds of people who eat there as well as those who don't, such is the scale of McDonalds relentless promotion and ubiquitous retail presence. The Red, Yellow and White colors are also a key part of the permanent repertoire of associations that are tied to the brand. All of which makes it odd indeed that a relative minnow of a player - Jamba Juice - should use these colors in the branding of its own breakfast offering. True, the white strip on the right-hand side promotes Jamba Juice as the owner of this message, but it occupyies only 1/4 of the entire advertising space. We believe that the large red block is so dominating that it is likely to be processed as a separate unit, and so mis-attributed as a McDonald's communication. We're also left wondering why Jamba Juice doesn't sharpen the distinctiveness of its breakfast offering compared with the burger and biscuit behemoth. After all, this is a time when people are more aware of the health consequences of eating than ever before. A missed opportunity in our book. Or perhaps, a nervous David afraid to pick up a gauntlet against a category Goliath. A strategy of direct contrast against a well-known entrenched competitor can be highly successful. It worked for Veryfine beverages back in the late 80s when they positioned their 100% juices against sodas (at a time before the explosion of Snapple, Sobe, Nantucket Nectars and Arizona Ice tea on to the market). One simple yet memorable ad featured a Pepsi can next to a Veryfine bottle. 'Gas' it read under the Pepsi container, 'Guzzler' underneath Veryfine's. The point was telegraphed. There's only such much soda you can sup without feeling full of gas. But a beverage without the carbonation? You can drink as much as you want to quench a thirst. For litigious-fearful among you, the Veryfine brand - largely unheard of at the time - got tremendous credit for the boldness and courage it displayed in challenging a giant. Something that replacing the Pepsi can with an air-brushed generic soda can would not have inspired. As a brand, if you are a David facing a Goliath, act like it. You have a legion of devotees waiting to believe in your cause if you authentically embrace it instead of hiding in the shadows. OFD believes that inspiration is so important to keeping the color and creativity. In work. In life. Whatever the context or relationship. But it's also something of a riddle. It is hard to find inspiration by looking for it. It is as if the act of searching itself contributes to its elusive. The solution of course is NOT to look, and instead focus the mind; create a state of passive alertness so that the sub-conscious picks up and notices the very elements in the surroundings that one cannot find by deliberately searching. 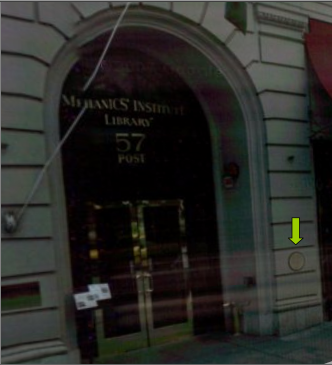 A case in point: The Mechanics Institute. Who would have thought that it would provide such sound advice for an aspiration that many brands would do well to strive for? We live in an age when people value actions from brands over words, utility over endless preaching. Brands that get it are those that realize there are many facets to this value-minded consumer, including delivering relevant content that's been digested, and framed to be easy to assimilate and delivers real utility to the recipient. Not information, but knowledge. Think about your brand's website, its retail environment, your marketing communications. How much work and effort does a prospect have to expend for the privilege of engaging with your brand? Is 'entertainment value' strategically minded or a tactic that actually distracts from a more pressing need to deliver utility quickly, effectively and colorfully? The credo of The Mechanics Institutes is good brand advice indeed to keep at hand. Inspiration found in an unlikely place while not being sought. And that's kind of the point. Parody display is an odd phenomenon. At its heart lies an expensive imitation of less fortunate living. As a fashion statement, torn jeans are one example of a parody expression which first emerged in the 1990's. Celebrities like Lindsay Lohan and other pop culture influencers of the mass market adopt them precisely because they are in contradiction with their own wealth and success. It costs more to buy these jeans torn than un-ripped (much to the consternation of parents everywhere placating their children's demands for the latest 'in' thing). It is an indulgence of the affluent. The idea that something worn - damaged even - is worth more than something new is itself not new. Why not furniture? 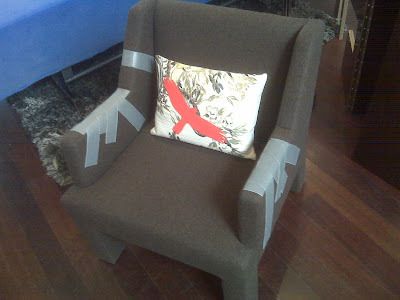 Duct-tape is a universal measure to fix and patch up almost anything that's ripped, torn or broken. Leveraging this association as a purposeful design element in furniture is classic parody display. No one would so willing put it on display unless it carried different expressive value. We've covered this topic from a couple of angles. 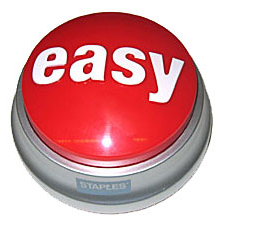 Staples creating customer value and perceived differentiation through the use of the Easy Button device. As we move on to cover other aspects of effective branding practice, we close this chapter with a classic example, courtesy of Crispin Porter + Bogusky. In terms of execution, the genius behind their work in 2005 for the Anti-smoking Lobby was in how it took disturbing aspects of smoking that people had become inured to and made it tangible. Everyone knows that tobacco causes cancer. Everyone knows that people who smoke die. The problem was that no one had found a disruptive way to make it accessible to the people that matter most: teenagers that are in a crucial experimental, proving themselves phase of life who are developing habits. 1200 people a day die from smoking related issues. This number too though is abstract. It's the equivalent of about four jumbo jets crashing, but this does not bring home the horror of the scale. 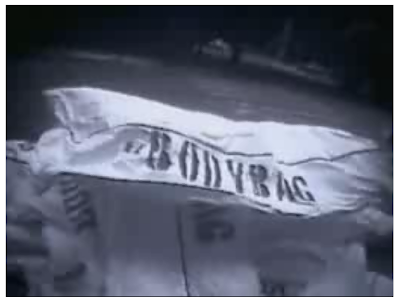 Body bags are an highly charged image, infused with emotion in our culture. They are not a common sight yet are highly familiar, from media coverage of soldiers killed at war being returned home as well as domestic tragedies like traffic accidents. By using body bags - the sight and sheer number of them - CP+B put the issue on lips of the very people they were seeking to influence. Behind the exeuctional brilliance though, was some terrific strategic work without which the great work wouldn't have happened. The very authoritarian `Don't smoke,' message of past anti-tobacco ads backfired because young people tend to do exactly what they are told not to. Kids need a common enemy, and kids hate more than anything to be lied to, and hate to be manipulated." 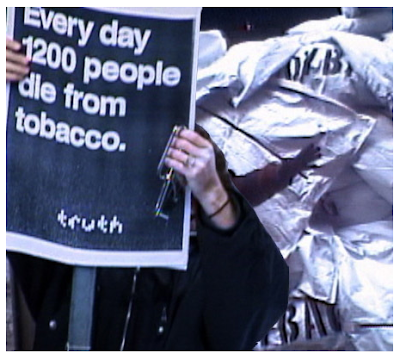 The "truth" campaign did just that, telling teenagers that if they smoke, they're playing into the hands of Big Tobacco. Culture is an adaptive organism. We're fascinated at OFD by the organic nature of popular culture and the ability for ideas to be taken, re-appropriated and turned into something new and different from the original intension. 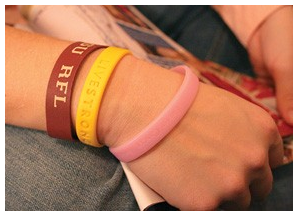 Take the Live strong bracelet. 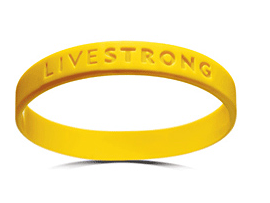 It started as an idea to raise money for the Lance Armstrong Foundation and quickly became a badge for people who wanted to show their allegiance with the Live Strong philosophy of life. It became a cultural touchstone and was imitated by a variety of charities to promote their own causes. In perhaps the most bizarre adaptation, it was appropriated in China into candy (confectionery) as a medium for delivering messages. Now take the twisted ribbon. It started out life being an emblem for Hope For The Cure in support of cancer. Now, the shape has become a loose canvas on which a whole variety of themes and beliefs are sketched. Gotta love cultural appropriation, an endless shifting sand. There's hope in the tendency, and maybe a little opportunistic money to be made too. Slowly but certainly, the need for things to match in how we express ourselves has shifted. This is no small feat. The matching mindset has dominated for several decades across a variety of milieu in mainstream culture, from fashion and furniture to home furnishings. A table set with unmatching napkins and napkins rings upon unmatching placemats would have been unthinkable in our parents' generation, but now it is all the rage. It's not just growing up with GrrAnimals that has conditioned people to adopt this way of patterning. Many evolutionary biologists believe our brains are wired to seek out sameness in the world around us, as something unfamiliar represents a potential threat. So too with symmetry: a better procreation partner is one without noticeable deviations from a symmetric norm (genetic abnormalities do not bode well). There are also consumer behavior advantages to a bias for matching. It simplifies the purchasing process because an entire set can be confidently bought with relative ease. The ownership experience is also helped: there isn't going to be criticism from friends or acquaintances about incongruent elements because there are none - though the overall style itself may be disliked. It was thus encouraging to see the trend of departing from sameness on show at ABC home furnishings in NYC this past weekend. In a variety of living room settings, there was clearly one chair which in no way matched any of the others. In fact, so much did the chair not fit the color scheme of the rest that it seemed deliberately chosen, a suggestion that standing out by not fitting in has virtues. The more observant will have noticed that the inclusion of beige colored cushions on the couch provides a connective thread that ensures the mis-matched chair is interpreted as planned and not an accident. The same tactic is used on the top photo with blue cushions. True, this takes away from what would be a much bolder statement - a chair that is completely orphaned. But it's something. Appreciation for good design has gone through a similar evolution (and emancipation one could argue) over the last 5 years. Design aesthetics have filtered down and entered mainstream consumption thanks in large part to companies like Target that have made it an explicit part of their messaging and implicitly reflected in their merchandising. So what brand will it be that takes a leadership role in helping mass consumers develop their curatorial capabilities and give them the confidence to abandon the blandness of matching for the bolder expression of their own richer, more eclectic style? Jet blue are trying to create some cache for their brand. You can't blame them. The Low Cost Carrier market has really heated up recently. It's more than soaring oil prices eroding profitability: new competition has arrived in the form of Virgin America, which offers a great branded entertainment experience that flies between SFO, LAX and Las Vegas to name a few West coast cities. It seems a bit cheeky therefore that Jet Blue have copied an approach that Virgin Airways took a few years back. In August 2005 Branson's airline introduced the world to a new type of jetsetter, the Jetrosexual (a thinly veiled reference to the then recently defined demo/psychographic - the metrosexual). Virgin defined this group as "globe- leaders among "a new emerging business culture" who are "rock stars of their industry...those who "leave the terra firma behind each day to move business and culture forward."" Jet Blue has now introduced 'Jetting'. What was once the province of an upwardly mobile jet set has been recast for the mass-market. It comes with leather seats, and award winning customer service which, in a distinctly democractic twist more indicative of Southwest, is available "for everyone". It remains to be seen how effective it will be given the vastly better planes, human touch and service of Virgin America. A good brand is nothing if not a clear and compelling point of view. Crafted correctly it is a compass, one which helps people more easily navigate the category in which the brand belongs and gives it a lift above the fray. Why does a point of view matter? A point of view is a reflection of a value or belief. People generally are motivated to form relationships and bonds with things that share not violate the values and beliefs they hold. When a brand extols a point of view directly and clearly it helps attract people who are like-minded and like-hearted. It also has the advantage of feeling rather noble. It is devoid of any obvious commercial motivation, such as the promotion of a capability, product or price. It inherently feels more earnest which is why people let their guard down and are prepared to suspend if not disbelief then hard-edged skepticism. The greater presence of brands engaging in point of view advocacy is the result of a widening appreciation of its value. In a previous era (Middle ages thinking) such communication was considered 'soft' because it was removed for direct impact on purchase drivers. But enlightenment has arrived. Marketers now realize that when done well it helps establish authenticity in the minds of prospects and consumers alike because the brand is issuing a forceful opinion behind which it is perceived to stand. It's not like the accountability of measurement has lessened - for attitudinal shifts in brand considerations and likeability are important dimensions of a brand relationship to see progress along - rather that the value of these shifts has increased in line with an evolved understanding of consumer psychology. It's action even a construction company can get in on. Some enlightened soul at Nibbi Brothers General Contracting saw the need to reshape perceptions at a time that might otherwise be associated with disruption, noise and dirt. While the firm touts itself as being "In the tradition of Old World Craftsmanship" there's nothing Old World about it's brand management. Promoting its point of view about what it takes to be a good citizen and positioning its business of building as one that participates in it is not just opportunistic, it's inspired. You expect to see counterfeit merchandise in New York City. They are a presence on every street that a tourist is likely to set foot upon and the variety of vendors is almost as varied as the goods for sale. On a recent Saturday morning, Sixth Avenue was shut down and a selection of stalls and concessions stands were lined in an orderly fashion along either side of the street. There among them was a cathedral to counterfeiting, a purveyor of the finest knock-offs proudly promoting its wares. Why be bashful? Rather than pretending to be something other than it is, embracing the true nature of its business actually bestows a sense of authenticity. The dose of irony is welcomed at the very least. There are few other brands that could fare better by facing their true selves and getting more favor from shoppers as a result. Though incredibly advanced in scope and scale, the brain is a patterning machine at its core. This structuring activity is submerged in our subconscious most of the time. Nonetheless it manifests itself through our behavior across all areas of our life. Marketers have to work with rather than against this tendency to achieve their goals. If a marketer wants to promote trial of its brand which is not a part of a group's consumption pattern it has to provide some inspiration to disrupt the existing behavioral and relationship order. Providing a fresh perspective - a new way of looking at things - stimulates the mind to engage and reconsider. It requires understanding the psychology of people and consumption. It could have promoted taste, but many other brands have used taste so this is not new. It could have promoted a unique flavor, but it does not have ones so unique as to be new. What will disrupt? Challenging the accepted relationship between ice cream and cone. The idea of an ice cream serving so large that the cone is barely visible suggests a new possibility: that ice cream can be consumed on a scale previously unthinkable Supporting copy explains what makes it possible: "Dairy free, cholesterol free and available or mass consumption". It concludes with the suggestive invitation "Indulge". The visual telegraphs this disruptive relationship simply and directly. The image is arresting precisely because it is so unusual. In doing so, a door in the mind has been opened and the brand has successfully stuck its foot in it. Staples had nothing to differentiate itself in the business supplies category. Office Max and Office Depot offer the same brands at similar prices. Find some aspect of value relevant with consumers that would reposition Staples as a better choice. Visual: The Easy button icon promoted simplicity, convenience and a hassle-free experience in a fun way. Staples has created a compelling basis for differentiating by making formally intangible qualities visible. 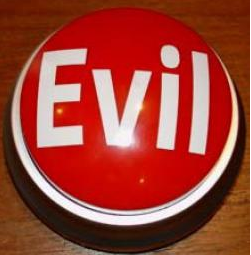 The button device was so highly appealing that its popularity extended far beyond what was expected. Over 1,000,000 were made bought and it passed into popular culture, inspiring extensions and imitations. Brand stewardship is an exercise in managing people’s relationship with meaning. But a brand should also be considered an agent for helping connect people with value. It's one of our core activities in the work we do for Clients here at OFD. Value of course involves far more than price: it’s all the other benefits that consumers derive from consuming a product or service – and not just in a functional or physical sense. Psychological rewards are a key part of the unconscious value assessment that people carry around in the heads and which draws them towards brands or pulls them away. By recognized that a key element of consumer value had gone unowned in its category, Verizon improved brand differentiation and leadership significantly. Coverage is a big issue with cell phone users. Poor quality reception disrupts a conversation, causing frustration. For years cell phone companies have boasted about their coverage, either the reach (national coverage maps) or the quality (like Sprint’s pin drop). It’s become a completely undifferentiated claim and consumers have no way or reason to believe one brand is better than another. The network is an idea that’s invisible and abstract. Consumers hadn’t been connected to it, even though ironically they use it every time they make a call. Root the solution in something from the consumers’ world so they can relate to the network idea better. Visual: Use the idea of the Verison workforce as a human embodiment of the network, which literally follows a verizon user around as they go about their day. Aural: “Can you hear me now? Good.” recast a commonly overheard phrase people say when poor reception is hampering a conversation and turns it into positive affirmation of network coverage quality. 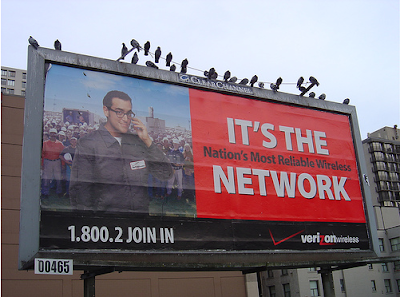 Verizon's network has powerful tangible benefit to people, by using a distinctive, visual and aural branding device. You'd be forgiven if thinking these establishments are in Europe. You'd not only have the wrong continent but the wrong side of the world. They are in Tokyo. One will encounter relatively modest coffee shops such as these bearing French names but with no evidence of any other connection to that culture. According to a local there's a clear hierarchy of style in Tokyo. Way, way at the bottom are US brands. 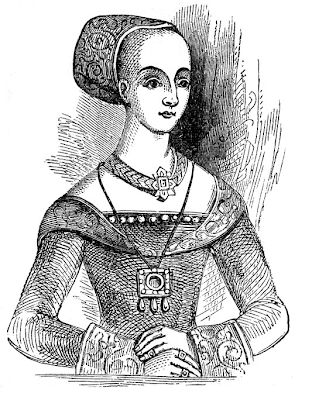 Above them, reside the Spanish. Above, the Italian's take second place. In pole position, come the French, envied deeply for their style in clothes and gastronomy. So when it comes to sizing up places to grab a coffee or bite to eat on the go, one really can't judge a book by its cover. It happened at tea houses and coffee shops all over Tokyo. People not so much sitting as slumped on the table in front of them. The casual observer would be forgiven for thinking something had been slipped in their drink. These strangers at rest are so completely cold to the bustling world around them. This site would make the folks at Red Bull smile, and think of this as potential distribution for their high-energy drinks, even when not mixed with spirits.